Made from ultra-light, extremely breathable AVERTIC™ pro lite cut protection material (EN 381), developed exclusively for STIHL. This six-layer material is approx. 20% lighter than the material used in ADVANCE clothing. Black, special ventilation fabric on the back of the leg making this clothing perfect for hot days, fully elasticated crotch with ProElast, closable pockets, long zip makes the overalls easy to put on and take off, reflective areas for better visibility. KWF Utility Value test pending. 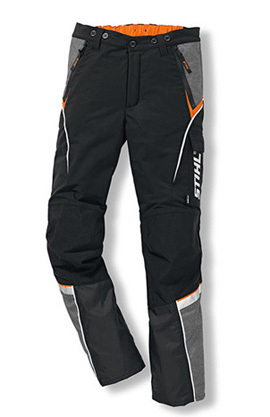 Trousers, protection class 1 (=ˆ 20 m/s), sizes S – XXL.